I'm trying to add a custom 'Open in Explorer' button to the page using Content Editor Web Part. (it does the same when I use the 'Open in explorer' option in the ribbon). But after the little window closes, file explorer never opens as it should.. The code now sometimes works? And the default button in the ribbon sometimes doesn't? So, Please make sure about below points. Go to Administration Tools --> Services. and check WebClient service is running or not. If not then please do start it. 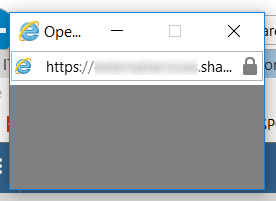 Even the default 'Open in Explorer' button sometimes doesn't work if the site is not added to trusted sites.